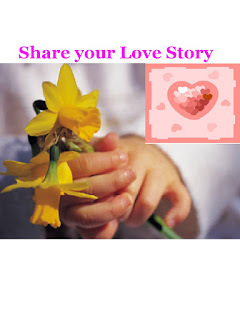 Shakehand with Life asked you to about sharing your love story under the blog title Share your Love Story. In response of that many stories are coming and many people are mailing and calling to tell their stories. A few selected beautiful stories , I would like to share with you. Best will be published only on 14th Feb. 2012, Valentine's Day. It was the month of July in 2006, when I first met her in my college. Her body language and her style of talking bent me towards her. These two features were most appealing in her. When I saw her, I was not able to turn my neck on any other side, I felt that my heart had been going towards her. I started to get her number and after two month, I got , then I called her, she scold me first , but at last after three times when I pleaded for her love she gave her consent. Here my love story started, It had been gone for about two and half years. My most unforgettable moment of my life with her , when she hugged and kissed me and the most painful moment was when I got to know that she had engaged with someone else, I enquired her about all this but after some formal talks she didn't take my calls. I tried for 12 to 15 days and last his mobile got switched off. Today even after about 4 years I am not able to forget her. I do not know why did she do this to me? I don't want to say that she deceived me , It might be possible that , the person who came in her life is better one than me. But still she is in my memories like the beats in my heart, and some time the memories come in form of tears through my eyes. I always pray for her , where she may live , she got everything which I wanted to give her. I am thankful to Mr. Sharma who give me the chance to share my story through his world famous blog portal Shakehand with Life giving me the opportunity to show my love for her and showing that my heart is still vacant without her. I wish all best to "Shakehand with Life" and you. XYZ, ( Name hidden for privacy) New Delhi, India. It was the matter of Oct. 2000. My love story started from my friendship with my loved one. I came to know this after about one and half year. During the time being I had been best friend of her. We had been studying in JBT course. We were the best friend of each other and share everything to each other that requires by a best friend. During this friendship I started feeling for her something special. Her beautiful smile and her deep eyes always fascinated me. And after Oct. 2000, I had started fallen in love with her. I had always been looking for her in my college. I couldn't imagine a single moment without her and at last I proposed her to marry with me with five Roses. One Rose before every word "I - WANT- TO - MARRY - YOU". She responded like she was also eagerly waiting for this and said "I am agree." My most unforgettable moment with her was when we together seen the Movie "Mohabbetein". Those were very cozy and comfortable moments for us and I never forget those moments in my life. After that I started preparing for my marriage with her and find agreement of my family. But when I heard that her family was not ready to give her hand in my hand at any cost , I completely broken down. I felt that nothing had left in my life. Now I am a married person and living with my wife and my children. I have no complaints from my life and from her side that why she is not with me today, But she is still in my memories and some time she comes in my dreams. She looks smiling and cheering same as she was in college. I pray for her, "where she is living, she may get every happiness which she deserves." But my heart is still beats for her. I give my hearty thanks to "Shakehand with Life" and Mr. Sharma for his effort for my kind of lovers. Due to his efforts our stories becomes find places at this blog portal. I wish the blog page "Shakehand with Life" find all success. My story has been going on since Jan. 28, 2007, when he first came in to my contact through my friend. At that time I didn't know that one I would have been in love with him. After meeting with him I have been with him in formal talks and in a friendship behaviour, but about after six months I felt that I am in love with him. His hair style , his slim and tall body, his honest and caring nature bent me towards him. After that I always seeking his company as I feel secure , cool and energetic in his company. Every moment of my life fills with roses when I am along with him.I can never forget a single moment which I spent with him. During this time I got little bit disappointed when I got to know that he already engaged with some other girl. But my love towards him continue. I didn't know that whether he likes me or not but I am sure about my love for him. One day I got to know that the girl with whom he was engaged has got married and hereafter he has been starting bend towards me. One day , collecting my full courage, I send a massage to him by my mobile that "I Love You" and the very next morning on Oct. 22, 2011 he called me and proposed me for marriage on mobile and I immediately said "Yes" as I am also waiting for this. After that we are preparing for our marriage, he discussed in his family and I am also looking for the right time to discuss all this with my family. I am very positive about my relationship and never think live without him. I hope both families will ready to accept our relationship and we will tie our marriage knot. I would like to pay my love to this beautiful page "Shakehand with Life" through which I am sharing my love story with the world. Mr. Sharma really doing the work of appreciation. I am eagerly waiting for the best love story which Mr. Sharma will publish on this Valentine's Day, Feb. 14. I wish all the best for "Shakehand with Life"
I met my love in a management institute. This was the incident of Feb.2009. She worked there as student counselor. I generally fought with her on small things and never thought that I would have fallen in love of this girl. I never took girls seriously before I came in contact with this girl. She had guts, which impressed me very deeply. Her long and beautiful hair always fascinated me. Her simplicity always bent me towards her. After about two months I felt abnormal in myself. I always want her to near about me. A look of her gave my eyes ultimate satisfaction. She always put question marks on my bad habits. Here I confirm about myself that I am in love with her. One day when I was leaving her to her home on my bike she took my hand in her hand and asked me whether I am serious about her? My lips were sealed and I couldn't utter a word. This moment was unforgettable to me throughout my life. I felt calm and peaceful in her company. One day I proposed her for marriage on my mobile. She gave her consent. But my real difficulty started here, her parents had not given their consent for our relationship. At last the day was came when I heard news of her marriage. Tears from my eyes were continuously falling. I was feeling that everything have lost, nothing remains in my life. I managed myself for my mother and accepted everything what had happened to me. She is now married and hope that she has everything which a good wife need. But still many times my eyes filled with tears. I have no other option to accept that she is not with me. But to love someone or having someone in my heart is not a crime. She always remains in my heart no matter she is not physically with me. I wish for her healthy family life and beautiful future. I would like to thanks to "Shakehand with Life" and Mr. Sharma who create this opportunity, where I can share my story and my experiences with rest of the world. I wish a great future of "Shakehand with Life"
Rohit seems deeply hurt. But a nice guy. XYZ is busy in his family feard to disclose his identity. I wish Nidhi will get success in her dreams. Deepak, My sympathy is always with you. I would like to say to both deepak and rohit, please look forward in life.